The therapeutic benefits of chanting include relieving chronic pain, depression, anxiety, and speech impediments as well as improving concentration, speech, and memory skills. Traditionally, before memorizing it, you first listen and repeat the chant, and then you learn the meaning. Sound is sacred and healing in the Yoga Tradition of India. In all of her classes, Maggie Reagh, Founding Director of YTI, uses simple chants from the Vedas and Yoga Sutras with a universal appeal for all belief systems. They often bring her students to deeper levels of peace, joy, and presence within their minds and hearts. As one student remarked, “I love chanting because it replaces all the words in my head.” Try chanting “Om” while thinking about what you want for dinner – it isn’t easy! Consequently, chanting is used therapeutically during āsana (poses), prānāyāma (breathing), and dhyāna (meditation) practices during all of Maggie’s classes. As well as teaching chanting in-person, Maggie is also now teaching chanting online in private classes. Chanting the sacred sounds of India can bring you a pain-free body, powerful speech, and a sharper yet peaceful mind. Painfully shy as a child, Maggie would often stutter when nervous. Her mother introduced her to sacred singing at the age of 5, which Maggie credits to healing her speech and teaching her how to read. Her 10 years of singing Early Music and Gregorian Chants from the Anglican tradition gave her a strong foundation for her subsequent training in Vedic Chanting and more recently Kirtan music since 2002. In addition, every time Maggie comes home from a couple of months in India with her teachers, she comes home feeling sharper mentally as well as more joyful emotionally. In fact, her first experiences of yogic bliss (ānanda) came while chanting in Vancouver after years of study in India. Following Śri TKV Desikachar’s advice to her in January 2002, “Chant and sing as much as you can for your healing,” chanting has indeed become a profound part of both her personal practice and public teaching. 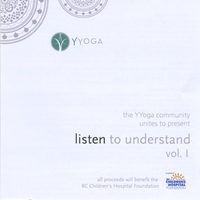 See Listen to Understand Vol 1 for Maggie leading the Eternal Om with 15 other yogis, singing Lokah Samastah Sukhino Bhavantu (her first composition), and singing soprano in Om Shanti. BC Children’s Hospital:100% of proceeds from the sale of this CD will benefit the Excellence in Child Health Fund, which supports the most critical health-care needs of children in BC today. I link with the Source of All, the Eternal OM – It heals my both my conscious and non-conscious mind, linking me to my spirit beyond the changing mind. I bow my head to my Heart and link with that Inner Knower within me. I honour all the Yogacharyas/gurus who have passed down this lineage of teachings. May all obstacles be removed from that Om that links us all together at the Heart. May this Peace free us from our own negative actions (adhatmikam), those of others (adhibautikam), and any natural disasters (adhidaivikam) – These are the three types of human suffering. Note: With one line chants that can be used as japa mantras (repeated chants for meditation and linking with Source/Iśwara), start chanting loudly before gradually chanting more softly, and finally silently. This is said to affect our three states of being: physical, energetic, and mental bodies to beyond our minds. Chants are used therapeutically for each aspect of our being. Japa mantras are ideal for prānāyāma (lengthening the breath) practices instead of counting the breath mentally. This is called Samantraka/Sagarbha (with mantra/with seed) Prānāyāma as opposed to Amantraka/Vigarbha (without mantra) Prānāyāma.